Is zero weight a feature? As I’ve spent more time with my Kindle I’ve been paying more attention to eBook prices. My conclusion is that zero weight (or perhaps just the novelty of eBooks) is a feature, and one that the supply chain thinks is worth a premium. 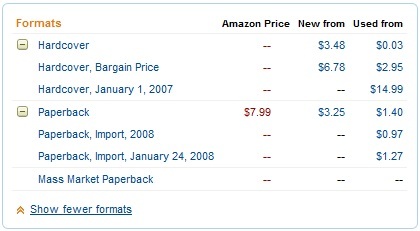 Typical pricing for eBooks seems to be the same (or just below) the price of a hardcover book for a new release, and similarly just below the cost of the paperback when that comes along a little later. There are some egregious exceptions, but that’s the typical pattern. It’s a pattern that makes intuitive sense to most buyers, as eBooks don’t incur physical printing and shipping costs (though they may attract taxes such as VAT that don’t apply to dead tree books). The Kindle edition seems good value against the paperback at 22p cheaper, but by going the dead tree route I could have a new paperback from elsewhere for £3.30 (almost a pound less than the eBook) or a used one in ‘Very Good’ condition for £2.76 (a saving of £1.51 [35%] against the eBook). So if all I want to do is read the words then there are clearly cheaper routes than the eBook. But I have a fancy new toy in my bag, and I don’t want to lug around a space gobbling weighty chunk of dead tree, so maybe I will swallow that eBook premium (though not this time – I have enough books that I haven’t read, so I’m not in the market for eBooks of stuff that I’ve read already – I was only even looking at Halting State as I was recommending it to a friend). So I have price transparency for many varieties of paper versions, but not the eBook (and it seems that the UK price is OK for a $1.5/£1 FX rate). So the price for the Kindle edition that I can’t see, and he can’t buy is $6.99 (~£4.67 – a little more than the UK version). Confused? I am. Amazon say that it will (soon) become possible to buy stuff for Kindle on people’s wish lists, so maybe these issues will go away. but I’m not holding my breath. Which brings me back to my original point. I want stuff on my Kindle (and want other people to be able to buy wish list stuff for my Kindle) because I think zero weight probably is a useful feature. A prize for anybody who can offer a rational explanation why pure information in digital form is taxable, whilst information pressed onto smashed up dead trees isn’t? There’s an exception here for reference books, which typically aren’t read cover to cover in the first place. I recently bought the eBook versions of pretty much everything I’ve ever owned from O’Reilly that’s made it to the new format (using their $4.99 eBook upgrade offer). Whilst I really like my kindle, I think the per-book portability and availability tax, as well as the lack of loaner feature is getting on my nerves. Whilst I have no reservations about rewarding an author for their intellectual effort, I somewhat resent having to maintain the profit margins of a dying business model as traditional publishers refuse to die. Lending is supposed to be coming soon on the Kindle, but unsurprisingly there’s much BS that comes with the feature. I think you’re right that this could get worse before it gets better. If opacity is used to blinker a consumer then it potentially allows for price discrimination like never before. Though the web routes around such issues – I can already envisage whatipaidformyebook.com (and I’m not even going to waste $10 on getting it for myself). I also want to see authors (and the other necessary protagonists in getting a manuscript turned into a book) properly rewarded. I love it that I can have all of Cory’s stuff on my Kindle for free, but fear for the sustainability of that model as eBook readers gain popularity. Tip jars, donate to charity schemes and ‘buy my other more exclusive stuff‘ all have their place, but it doesn’t feel like mainstream publishers have figured out the new course yet, and Amazon is looking a lot like WalMart in bashing the supply chain into a shape that suits it rather than authors or consumers. So long as there are all those price-insensitive consumers out there, it’s going to be hard to rationalise the pricing!